There are plenty of ways to die in a game of Overwatch. From being devoured by spiritual dragons, to shot in the head by a time-travelling cockney, to being knocked off a cliff by a super-intelligent hamster. But one way you can’t be killed is via fall damage. Except that very nearly wasn’t the case. In a post on the Overwatch forums last night, one player asked how different the game would be if you had to account for gravity-based accidents. As they point out, Junkrat would have to be careful with his mine jump, while Pharah couldn’t just launch into the air with no consequences. The thread caught the attention of Overwatch’s lead designer, Jeff ‘Papa Jeff’ Kaplan, who chimed in to say that “we actually tried falling damage in the early development of Overwatch.” Unsurprisingly, it wasn’t the gravity-obeying characters who caused problems – Reaper, Widowmaker, and Pharah were all on the list of problematic heroes, while more ground-bound heroes like Reinhardt and Roadhog remain off Kaplan’s list of airborne troublemakers. 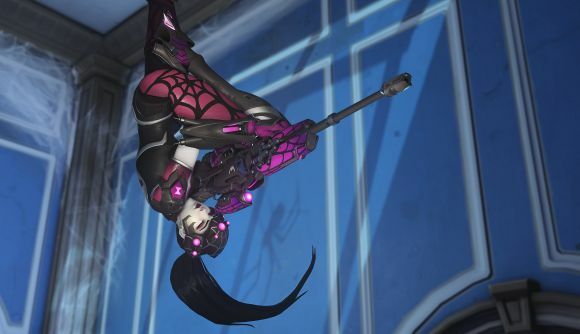 “With Widowmaker, it felt strange and unintuitive to be able to grapple to high places but not get back down,” leading to a strange phenomena where players would be grappling themselves downwards to avoid a fall. Pharah players would need to “feather your jets right before touching the ground” to avoid a nasty chunk of damage. The weird interactions meant that the team began exempting characters that could get up high from fall damage, giving them all the reward without any of the risk. Eventually however, “it felt arbitrary who would take fall damage and who was immune,” so the team removed the mechanic from the game completely, allowing any character to launch themselves dangerously into the air. Given how many times I’ve accidentally crippled myself in a game of Counter-Strike by misjudging fall height, I’d say that that was probably a good decision.